"The end of a perfect day is a gift to those who linger to watch the sunset on the Pacific Coast. soon blue skies will turn gold, clouds will deepen, and you must reluctantly say 'goodbye' to the coast for one more day." Artist comment: "This small oil on stretched canvas started as a study in gold and blue. I wanted to explore the consequences of the angle of the sun that creates this experience. I observed while on location at the Oregon coast, the circumstances that surrounded the scene before me. Most notably the wave was a very distinct yellow-green as the sun shone through the translucent water when the wave approached the shore, broke at top, and began to roll. The shadows were lengthy due to the low angle of the sun, and the tips of the foam were just barely catching the light. In my studio, I expanded the small oil study into a completed painting." 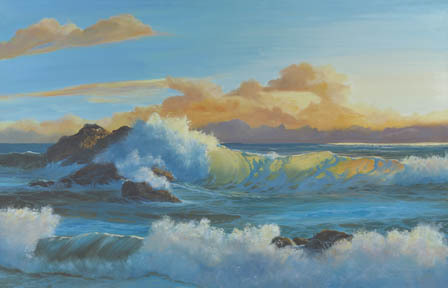 "Coastal Endings" is a limited edition, giclée print from an original oil painting by Carol Thompson. The edition includes 3600 authorized, signed, limited edition prints (3500 numbered and 100 artist proofs). Release date is August 2002. Image size and substrates vary. All prints are signed and numbered by the artist and include a certificate of authenticity. Paper prints are shrink wrapped on foam board. Canvas prints are coated with a protective spray. Some print and/or note card images may be artistically cropped or extended to accommodate the size and/or shape of the artwork.